Well, at least no one asked about Derrick Rose for a change. Because in the Bulls’ 119-118 overtime loss to the Denver Nuggets Monday there is likely to have been some history made. No, not necessarily the Nuggets’ 12th consecutive win, or Nate Robinson’s season high-34 points or Joakim Noah burnishing his possible Defensive Player of the Year credentials and path toward a quadruple-double with 14 points, 12 rebounds, seven blocks and six assists. All of that made for one of the most entertaining games of the season, albeit disappointing results for the Bulls still playing without Rose, Kirk Hinrich, Taj Gibson and Richard Hamilton. It was the stunning and confusing conclusion that most likely is going to result in an NBA rules change regarding instant replay. Because whether the officials got it right or wrong when Noah appeared to win the game with an amazing finish of a Marco Belinelli miss with 1.7 seconds left, the spirit of replay failed–of getting it right–because the officials were caught interpreting a technicality in the rules. The replay rule effectively states the officials can review goaltending–the issue here–in the last two minutes and overtime. But in order to review, one of the three officials must make a call on the floor. “I thought we had video stuff to make sure we got it right,” said Bulls coach Tom Thibodeau, who was certainly the most upset since coaching the Bulls and had to be retrained by players and team officials. But Thibodeau was exactly correct in his sentiment. There’s no point to replay if technicalities prevent the officials from taking the correct action. There’ll be debate from both sides as to whether the ultimate calls were right. The point was, which was most upsetting to the Bulls, was the inconsistency of the behavior. With 46.4 seconds remaining in overtime and the Bulls leading 115-114, Denver’s Ty Lawson’s drive was missed. Center Kosta Koufos went back up with two hands with the ball still apparently on the rim and put the ball back in for a 116-115 Denver lead. It seemed certain Koufos pushed the ball back in while it was still touching the rim. That would seem to be offensive goal tending. The Bulls bench erupted, and Thibodeau asked the officials to examine replay as he called timeout. But Thibodeau said he was told they couldn’t look at replay because none of the officials made a goaltending call. This is why in altercations officials now almost always call a flagrant foul. And if there is not one they can reverse it. But if there was no call, they cannot review. Yes, how ridiculous is that. The Bulls didn’t object strenuously, but they never knew seconds later the lack of a call on the floor in their view would cost them the game. “I feel like it got stolen from us,” said Carlos Boozer. Koufos’ basket gave the Nuggets a one-point lead. But the Bulls responded coming out of the timeout as their new go to guy for the game, Robinson, missed. But this time Noah followed the ball in. One could say the ball had contact with the rim. But it was clearly off and coming down while Koufos’ seemed to still be level with the rim. Anyway, that gave the Bulls in this fabulous back and forth game with 11 lead changes and six ties including five overtime lead changes a 117-116 lead with 32.8 seconds left in overtime. The Nuggets went to their surprising go to guy for the game, former DePaul player Wilson Chandler, who had 35 points and had burned the Bulls with five threes when the Nuggets blew out the Bulls in Denver last month. They got the switch they wanted with Robinson onto Chandler, who began to back down Robinson. Noah came across from where he was defending Andre Iguodala in the endlessly changing matchups with a George Karl team and blocked Chandler’s attempt with 22.9 seconds left. Jimmy Butler rebounded. It looked like a Bulls steal of a win. Denver fouled Robinson, who left the second free throw short as Thibodeau basically went all the way with six players as reserves Marquis Teague and Nazr Mohammed got about eight minutes combined. Still, the Bulls led 118-116 with 18.4 seconds to go. The Nuggets went to Andre Miller to get Robinson on a switch again. 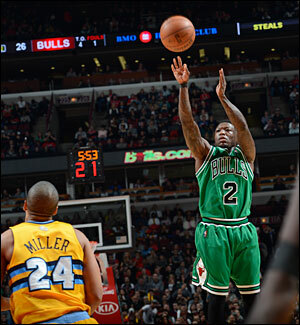 This time, though, Butler made the switch as Miller drove. Miller got deep. But Noah came off Iguodala in the corner to trap Miller, who stumbled and tossed the ball out to Iguodala, a 31.5 percent three point shooter this season, even below his career average. But Iguodala, a poor free throw shooter who clinched Game 6 in the playoffs last season with two free throws, swished the three to give Denver a 119-118 lead with 7.1 seconds left. Thibodeau took his final timeout and the Bulls inbounded at midcourt. The Nuggets deflected the inbounds, so the Bulls went into the backcourt to inbound again, but with 5.7 seconds left. 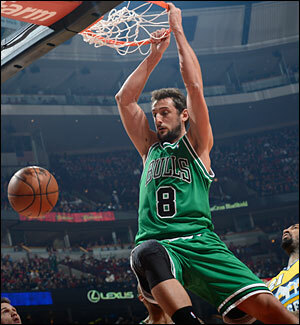 Luol Deng passed in to Marco Belinelli, who has made three game winning shots this season. Belinelli dribbled down the left sideline against Corey Brewer and fired up an off balance fadeaway from about 15 feet. As the Denver defenders all eyed Belinlli, Noah was trailing down the lane. As Belinelli’s shot began to come up short, Noah reached up with his left hand and tipped it in as the Bulls and the United Center began celebrating. And that’s when the controversy began. The Bulls were certain no official made a goaltending call and merely signaled a good basket. It should have been 120-119 Bulls with 1.7 seconds left. But the Denver bench and coach Karl were up screaming for replay, which the officials agreed to. Lead official Ken Mauer then signaled goal tending to take away the basket. Thibodeau erupted at the officials in a rage we’d never seen from him and Luol Deng got in front of him as Thibodeau complained about the apparent inequity of reviewing one play despite no call on the floor and declining to review a previous play in the same circumstances. That led to all sorts of questions. Like how did that differ from a lob, most of which would hit the rim if let go. Yes, Belinelli’s was a shot. But if you miss a lob and hit the rim it’s generally considered a shot. And, of course, the Bulls’ issue that there was no call on the floor of goaltending–Bulls players say they heard the officials rule “basket”–so there could not be a review under the rules. “You hate to lose a game that way,” said Thibodeau. But if replay was about getting it correct, as Thibodeau stated, it seems ridiculous there should be a caveat which prevents the officials from examining a close play at the end of the game or in regulation. You assume the league will change that before next season, though it does the Bulls little good now as they fell to 36-30 and in a sixth place tie with Boston, which lost to Miami winning its 23rd straight game. “Very disappointing,” said Noah, who tweeted “sick right now” after leaving the locker room. “I feel like you play this game so hard and maybe I just don’t understand the rules or something. I just don’t understand how you can review my tip in. But two plays before that you can’t review the other one. There’s got to be consistency in when you can review. It’s just frustrating how things like that can happen. I know that the refs are doing the best that they can in those situations, but it cost us the game today; it’s disappointing. And confusing as none of the Bulls players seemed to understand exactly what happened and what was supposed to happen. If you have rules that not only the players but the coaches don’t understand they are bad rules. This is a man who does nothing but study the NBA, as we know. If he doesn’t know it’s worse than we think. And needs obviously to be changed. Which is too bad because it obscured one of the more entertaining games of the season, a high scoring up and down, playmaking contest that seemed like the Nuggets’ for most of the night. The Nuggets had a 30-8 edge in fast break points with more than a dozen dunks, including one of those throw ins like Blake Griffin does from a few feet away by JaVale McGee. The Nuggets had 68 points in the paint as they cut up the Bulls defense for much of the game and a 53-42 rebounding edge. It’s an impressive Denver team at 46-22 and making a run at third in the Western Conference. But you can see where they could fall in the playoffs as their game is predicated on a fast pace and fast breaking and turnovers while they stall in the halfcourt with an inconsistent mix of jump shooters. Plus, as George Karl teams always do, they switch just about everything on defense, leaving them vulnerable to mismatches. But with the Bulls down so many players it was difficult for them to take advantage. Plus the Bulls, who still trailed by nine with 4:32 left and by 14 late in the first half, were thwarted by early foul trouble with Noah, which limited him to 10 minutes in the first half. Which was too bad because Noah’s passing was terrific from the start as he was hitting cutters going backdoor against the overplaying Nuggets, who look for steals and fast breaks. Athletic Kenneth Faried, who gave the Bulls trouble in the game last month, drew early fouls also and never was much factor. But that also changed things for the Bulls as the Nuggets went small with Chandler playing Boozer, and thus Noah having to chase a wing player like Iguodala or Brewer. Because Boozer doesn’t move as well, he always takes the slower, interior player assuming he is a lesser scorer. 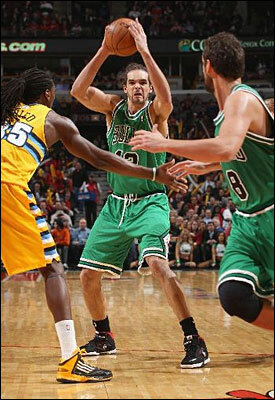 So when Faried went out, Noah was caught chasing on the perimeter. But he then drew a second foul with 4:16 left in the first and went out. That did enable the Bulls to matchup better as Butler came in and he and Deng both were sharp. Butler finished with 15 points on just seven shots and Deng had 21 points. The Bulls also effectively slowed the high scoring Nuggets, who led 21-20 after one. But the absence of Noah was felt in the second quarter as the Nuggets constantly got to the basket with little of the usual help Noah is best at providing. Denver took a 53-39 lead late in the second and closed the first half leading 53-45 as the Bulls couldn’t get a hold of Chandler. But Robinson did his best offensively to match. He’s not a true point guard, as we know, and players like Marco Belinelli have trouble getting the ball with Robinson at point. So Belinelli moves to point some, if only to feel the ball, although Thibodeau likes Belinelli’s playmaking ability as well and hard drives to the rim. The Bulls also with Robinson at the point have had trouble getting the ball to Boozer inside, and Boozer had just five first half attempts, though he would finish with 14 points and nine rebounds. Opponents have taken to fronting Boozer as the Nuggets did at times with Chandler, but then bringing help as the Bulls without Hinrich or Rose have mostly been unable to find Boozer with passes over the top. They did involve him more later as they put the ball more in Noah’s hands at the top of the circle or foul line to make plays. Yet, in this game Robinson’s offense was invaluable and essential. Faried had a couple of scores to open the second half and it looked like the Nuggets would pull away again. But the Bulls kept reeling them back in, this time with Noah roaming all over the place along with Butler. Boozer got going some in the third and Robinson kept the Bulls within 79-73 to end the third with a pull up three, one of six he made in the game. And from the start of the fourth on the fun really started, if the ending wasn’t so joyous for the Bulls. So, no, it wasn’t perfect the rest of the way. But it was entertaining. The Nuggets kept running Chandler on a crossing pick that freed him for scores, and then McGee made that highlight dunk running the court and taking a sideline pass and going over Noah. That put Denver up 87-79 with 8:38 left. And after Danilo Gallinari made two free throws with 4:32 left it was 96-87 Denver. Especially with this usually offensively challenged Bulls team. But they made plays this time. Butler got fouled shooting a three and made two, and though the Bulls couldn’t much stop the Nuggets with all the mismatches, the Nuggets couldn’t contain the Bulls. Boozer scored inside to get within 96-91, and then Robinson fired up a three on a handoff from Noah with 3:03 left to get the Bulls back within five. He looks good when they go in. Boozer then muscled Brewer out of bounds and Butler drew a foul and suddenly the Bulls were trailing just 99-96 with 2:24 left. Chandler got to the line and made two, but Belinelli scored on a hard drive and Chandler answered. Then Noah made a swift bounce pass inside for a Deng basket to stay within 103-100 with 1:30 left in regulation. Noah then rose up to block a Lawson attempt and Belinelli hit a step back jumper to bring the Bulls within 103-102 with 1:03 left. Miller came through for Denver with a driving score. But with 13.4 seconds left in regulation the Bulls ran a play for Robinson losing Miller on a series of cross screens and Robinson made the three pointer to tie the game at 105. The Bulls pressured the inbounds to smartly take time off the clock and Lawson shot an airball that Miller put in after the buzzer. On to overtime. And it looked like the Bulls would take it with the momentum of the comeback with the first two scores. But Chandler got a big tip in of a Gallinari miss before a Noah drive that could have put the Bulls up six. As it was, they were leading 111-107 when Lawson hit a three with 3:07 left and then it was a standing-the-rest-of-the-way game. Iguodala put the Nuggets ahead 112-111 with a pair of free throws with 2:41 remaining as the Bulls offense stalled and Miller hit a jumper sliding left for a 114-111 Denver lead with 1:47 left. But Robinson went all the way with a floater and after a Miller miss gave the Bulls a 115-114 lead with 1:04 left in overtime with a 22 footer. But then came the mess, the disputed Koufos follow, Noah’s tip and then block, Nate’s one of two, Iguodala’s three and then what would have been in the play of the season by Noah. The genesis of the rule, as many are in the NBA, comes from the dominance of Wilt Chamberlain. Teammates used to throw the ball up near the basket and Wilt would catch it and guide it in. Though that clearly wasn’t Noah’s intent as he believed he was tipping a missed shot coming up short.